It's been discussed on the podcast regularly that 'Average Can't Work Here'. It's even written on our walls! Kent and Kevin have focused on making sure that the team members that are hired at Memphis Invest are committed to exceeding expectations and are answering to a high level of accountability. That's how we've been able to maintain our culture as we've grown from 4 employees to almost 90. Many people would say that we're in the real estate business, but we consider ourselves to be in the PEOPLE business! 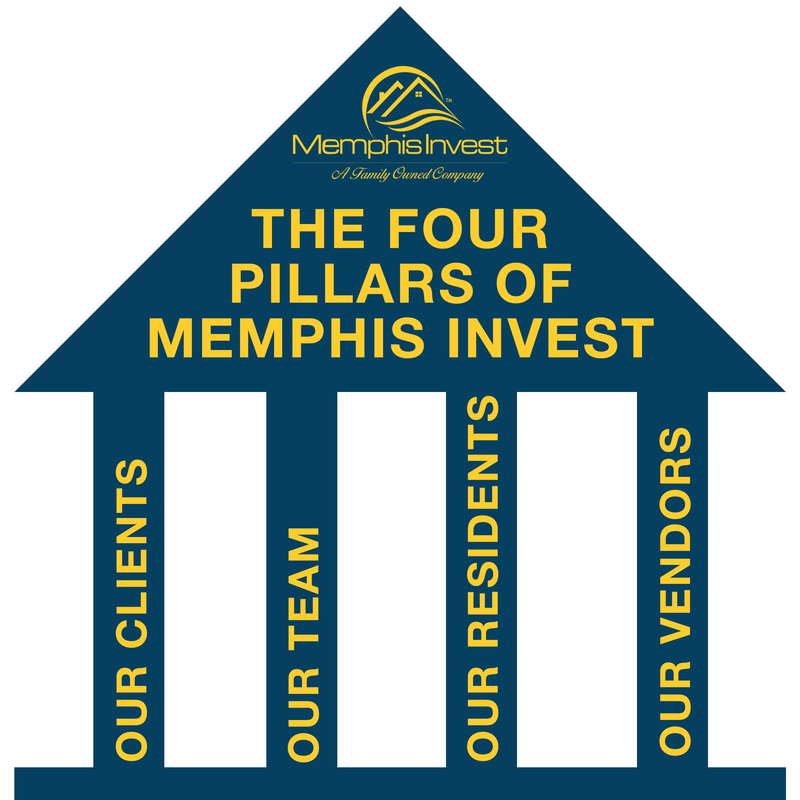 We've created the 'Four Pillars of Memphis Invest', which includes our clients, team, residents, and vendors. Kent has always said that our success depends on taking care of these 4 groups of people, and each one is top priority! If you are focused on people and doing the right thing, success is sure to follow! Much of this episode talks about a Mastermind group that Kevin and Ryan attended a few weeks ago. Mastermind groups are just one of the ways Memphis Invest contributes our knowledge and experience to other entrepreneurs, but we're also committed to receiving feedback, challenges, and advice from these amazing peers. It's invaluable to surround yourself with brainstorming, education, accountability and support to sharpen your business and personal skills. Whether it's a Mastermind group, a few friends or coworkers, or even a forum or podcast (like this one! ), creative thinking and goal setting can be powerful motivators for you and your business. So share your ideas and accept feedback and criticism, because it's the only way you can continue to improve and grow! Kevin puts it best when he says, 'You never know what you don't know until you expose your ideas to more successful people who can see things you may not see'. If you're consistently putting yourself in a room where you're not the smartest person there, you can do nothing but benefit from that experience. Listen, ask a lot of questions and learn so you can build your business and expand who you are so that you can be more of an asset to your team. Kent Clothier: Hello everyone, Kent Clothier, Sr., welcome to the Experience Matters podcast. Joined by my cohost Kevin Hommel today. We'll hear from him in just a second. Again, we want to welcome you to the Experience Matters podcast. You can find us on Stitcher, SoundCloud, and iTunes, and also on the MemphisInvest.com website where you can find the audio and visual. We hope you join us and again, hopefully we're bringing you some good content, something that you can take back and use it everyday, whether you're an investor or whether you're a business owner or hope to be either one of those. Hopefully we're bringing you some good content. Kevin we're up to about, we're getting close to 30 episodes here I think. I'm not sure exactly what the count is. Kevin Hommel: Yes, sounds about right. The last few Chris has kind of stepped in so appreciate him doing that for me. Kevin Hommel: Upward and onward. Kent Clothier: Onward to getting close to 30, so Kevin what's our topic today, and welcome back by the way. Kevin Hommel: Thank you, good to be back. I'm glad to be back in it. Our topic today is going to be ... I think we maybe talked a little bit about this but we're going to spend the whole episode on surrounding yourself with great people throughout your career, and obviously as we've expanded Memphis Invest we continue to be sending our executives, you guys as owners go to a lot of things, and I'm fresh off a mastermind last week where I got to spend three days in Tampa with Ryan Flannery one of our other executives, around some really, really good people in the real estate industry. I thought we'd hit on that, plus there's another story from your past on you trying to do the same thing and surrounding yourself with good people and rising to leadership and all the stuff that goes along with that. How does that sound? Kent Clothier: That sounds great. Well we talk all the time about we're not really in the real estate business, we're in the people business and again we talk several episodes ago about the four groups of people that we have and how important they all are. I know we share a lot of ideas and a lot of content with people, and I know you just got back with Ryan with our company from a mastermind down in Orlando a couple weeks ago. Take a second and tell us a little bit about that and why it was good for our guys and why it was good for the people that were there. Kevin Hommel: Yes, so the group's called Collective Genius. It's Jason Medley and a group that Chris is really familiar with and a lot of the folks in there of course know the family, the Clothiers, Kent Jr. as well and Chris could not go this time so he asked me to go sit in and Ryan had been before. The group is really the movers and shakers in the investment real estate space. It's funny that you said, "We're not really in the real estate business," because one of the main speakers, one of the main guys that puts this group on in the very first thing he said, "We're really here because we're all in the people business." That's funny that there's that same belief from very successful people. That was very clear in the room. The group is about 120 different businesses that are really high level operators in the investment real estate space and we are by far the largest company there, which I thought was interesting. I think what makes our involvement in that group one beneficial for us, but also beneficial for that group is that we don't really go in there as we're the largest company and you all can all learn from us. We certainly share and what we ended up sharing this time was our best practices for hiring people. We got a lot out of it being there myself and Ryan as executives in this company to what are some things that, as big as we've gotten and as specialized as we are in our areas, some of the areas that we can do better maybe in buying or better in the way we do our research for property. Everybody in that group, no matter how big or small the companies are by number of employees, there's a lot of high level thinking and that's part of the reason that we signed up and joined that group was not only can we help people in there but they can help us and surround ourselves with people that are just thinking the right way. It reminded me Kent obviously of the [inaudible 00:04:31] that you started, gosh how many years ago was that? Kent Clothier: Oh that's probably back in '07, '08, somewhere in there maybe. Kent Clothier: We had that REA to bring people together and create ideas and set different formats of opportunities for different people in the real estate space. In us it kind of evolved into the turnkey, and where others it may have evolved into just fixing flip, or just flipping houses, or wholesaling houses, or hoteling houses, whatever the case may be, or in the space that we're in in the turnkey but again that was all about just bringing people together and sharing ideas. The mastermind that you went to, and again I know for those listeners that may not be aware, there are a lot of masterminds out there in the real estate area from the beginning level to the CEO level that will bring experts together in these forums for two or three days, that sit around and figure out a lot of best practices that are working for other companies and share a lot of ideas and a lot of insights, talk about a lot of situations and problem solving that these different people may have and how that type of format can lead to more success in your business by being open and sharing with other people. What else did we pick up out of that? What was some of the contents you got down there in Orlando? Kevin Hommel: Well one it was great because we have the largest number of employees of any group that was there, so we did get to present and we had a lot of response from people in the room that said, "Man thank you so much for sharing what you shared about hiring." We talked a lot about average can't work here. I know our listeners have heard you say that so many times, but what we do is we talked about let's say 2010 to now, eight years later, starting out with 10 or 12 people, now a 90 and average still can't work here. Really it was about protecting the culture that you've built while we've still grown and that's what a lot of companies there are right at that point in their growth where they're going to start to scale up with people in business. Even being the largest really employer there, the largest company there, we still were able to pick up some maybe different ways to strategize on the way we buy houses, getting into more living rooms. That's a big deal with us with our direct mail that we've been doing. Learning from people, like you said, maybe don't do turnkey, maybe don't do property management, but they've nailed the buying side because they're a wholesaler that can get their way into living rooms and you know how many houses we buy from wholesalers. Learning some of their strategies and a lot of them are in different parts of the country. I think one of the things that I learned the most is some cities that maybe weren't on our radar that should be on our radar for us to continue to serve our clients at a high level with properties in the right cities. Again, any time you're building relationships, you know me that's my sweet spot. I love working the rooms and meeting all the players that I've heard all their names and all their companies names before and going to that and bringing back something that we can really take and execute on. Kent Clothier: Well again the masterminds and the Collective Genius is a really, really good format. I think I'm supposed to go up to one out in June and talk or be interviewed on couple hundred people, I'm not sure what it's all about, but I'm scheduled to be out there in middle of June. I'm looking forward to doing that. All of those events like that, again give you the opportunity to one present for your company, and if you don't take criticism very well you certainly don't want to be in a mastermind. Kevin Hommel: That is true. Kent Clothier: Part of the process is that you come in and a group of 10, 20, 30, 40, however many people and you present maybe in 30 minutes a particular segment of your company and you guys talked about best hiring practices. Then people will take some positive away from that, but they'll also give you some suggestions on maybe some things that you can do better, which is a whole reason why we go to something like that to try to figure out how we can learn to do things that we're doing better than what we are. Then share some of our success stories with other people that they may pick up some ideas from the. Did we pick up any ideas Kevin out there on how we can improve our best practices of hiring? Kevin Hommel: Oh absolutely, I mean one of the guest speakers was one of the guys behind The Four Strategies of Execution, The Four Disciplines of Execution. He's the author that wrote that book. Anytime you get to hear a very high level speaker, you talk to the authors and things out there, and coaches and consultants that have worked with very, very large companies I think everyone there got the benefit from that. I've already brought a lot of that back to our VPs and worked on how can we implement this throughout the ranks of the company? Again, other markets that we should be looking at, just the future relationships that will happen, there was people there that lend money so there's ways for us to borrow money differently. We have, I'm going to say my list alone is probably seven or eight things that I brought back that can immediately improve our business. Kent Clothier: Very good, very good. How many days was it? Kent Clothier: Three days in Orlando. Kevin Hommel: It was in Tampa. Kent Clothier: Oh in Tampa, sorry. Kevin Hommel: I think obviously having a nice location is just cherry on top. I don't think that really would have made it any less enjoyable if we were somewhere cold, but it was still nice to be on a warm place and looking out over the ocean. Kent Clothier: Jason always gets the good cities like San Diego, and Phoenix, and Tampa, and all of those things. Just a couple things on the best practices things and some of the things that we've talked about before, and you brought it up a minute ago about just try not to let average people get into our work force. We've had a little bit of turnover here in the first quarter of 2018, some of it by our choice, some of it by other people's choice where it just didn't work out. We're trying to do a lot better job at interviewing people and having a couple, two or three different people, interview them so that we can make sure that we're getting the type of person into our culture that has some of the same type of thinking that we have, some of the mindset that we have, and integrate them in there with our people that will be a good fit and a good positive workspace environment for people that we bring in from the outside. Not everybody is always used to what we do, which is a high level of expectation, a high level of accountability, and we're always going to push people and stretch people to be even greater than what they ever thought they could be. Hopefully through inspiration and expectation that we can do that, and sometimes that works with us to where ordinary people just do extraordinary things sometimes and just knocks us off our feet and surprises us a lot of times. We have people every single day, week, and month that step up and just hit it out of the park and do things that maybe they didn't think that they could. We may have thought it but it sure surprises, but sometimes it doesn't surprise us because we think sometimes people can do things that they don't think that they're capable of. You just put them in the right environment with the right processes and systems, the right people, hold them accountable and turn them loose. Then really, really good things happen. Kevin Hommel: Yes, that was our topic of presentation at this group specifically. Back to the original kind of idea there is even being a highly successful company, even having 15 years of experience, and even being the industry leader in the turnkey space, we are still participating, spending money, going to things like this. It wasn't cheap to join the group, it wasn't cheap to take me out of the office for three days, Ryan out of the office for three days, but we know the value is there and being around people that are successful. Even being the best at what we do, we know we can still learn things. That's the real takeaway for this edition of the podcast Kent is the listeners out there that say, "Well I'm already the best in my space," or "I don't see any value in going to these seminars and things like that." I mean you never know what you don't know until you go and expose yourself to other people that are successful that can see maybe something that you don't see. I think that's a principle that a lot of business owners probably understand. We get maybe blind to the things that are right in front of us because we've got the rest of it almost on autopilot. Being around that, surrounding ourselves, it's just like the people that came to your REA and I was on the board of that when you started that before. I was actually working for you, I don't even know if you remember that. Kent Clothier: I don't remember that, but now it kind of comes back a little bit. Kevin Hommel: Yes, and so those people that came to those meetings really were coming because you were the best in the business and they wanted to learn from you, but I think you also had the little huddles and the side conversations that would happen. We had a guest speaker at almost every luncheon that you put on, and so that was for us as a group how do we learn and not only teach ourselves, but how do we help these people that are paying to be members of the group that are their business? Kent Clothier: Well it's always about extending your education and a lot of times companies think they know it all and can't get any better. Believe me, if you just reach out and whether it's listening to a podcast like this or attending a mastermind group or attending a REA, or whatever, but meeting other people and sharing ideas and thoughts and ideas is really what it's all about. We encourage our listeners, whether you're an investor or whether you're an entrepreneur or newbie in whatever those fields are, that you get out and listen, listen, listen, ask a lot of questions and learn every single day on how you can get better, and again it has a lot to do with people. Sometimes you got to spend a little money to get out there and learn new things and meet new people that can help you build your business and add value, not only to you but to your company. Kevin Hommel: Yes and try to put yourself in rooms where you're not the smartest person in the room because you can learn a lot. I'm going to tell you, the number of guys in that room that were data superstars is what I would call them, data rock stars. It was amazing, younger guys that obviously understand the technology piece a lot better than some of us older guys do. It was amazing listening to them talk about programs and systems and how they integrate all this data and stuff. It was just neat to be around that. Kent Clothier: Overall out of that thing was there more content on the real estate side or the IT side or where did most of the info come from? Kevin Hommel: Yes it came from all angles, but all of it designed to help real estate professionals grow their businesses. That's really what the whole thing is about. I will say this Kent, as we presented I asked how many people have listened to the podcast. Over half the room that I was in raised their hands, so everybody out there right now listening, a few of them are going to be these guys that are going to be in that room, and so if you're listening and you hear this you're part of Collective Genius, it sounds like Jason and Kent are working on a little interview setup for the June meeting, which will be in San Diego so you won't want to miss that for sure. Kent will be bringing the magic as he always does. Kent Clothier: Every time we run into somebody that says they listen to the podcast I'm always kind of surprised because when we started this about 30 episodes ago I didn't think anybody was going to listen to it, and today we have over 20,000 people that have looked at or listened or watched the podcast that you and I have been doing most of them Kevin since we started. People are hungry for information and content out there. We do have a lot of experience. Our company's been doing this a long, long time. I've been in business almost 50 years and bring a few ideas and a few thoughts, then we got between Kevin and Chris and Brett and different people on our podcast from time to time, there's a lot of good information, good content on there for you guys to listen to and take advantage. What else today Kevin? Kevin Hommel: That's it, just don't forget, even if you're the most successful person in your industry and your space you can always get better and you can always humble yourself by surrounding yourself with people who are smarter than you that are also doing well and see what you can learn. Kent Clothier: Well again wrapping up, again the people are the most important thing whether you're dealing with people that you're buying from or selling to, in our particular case it's four groups of people. It's the investors that we serve, it's our residents, it's our vendors, and it's the people that work for us, and we work on those four groups of people in getting the right mix in there and I encourage you all to work on those four groups of people because you'll have success a lot quicker if you can figure out how to perfect those groups there, which we haven't but we're doing a pretty good job of it and always trying to get better on those four areas. You will have success in your business if you work on those areas. Again we thank you for listening to us today. Kevin thank you for joining us today. Kent Clothier: We want to remind you that you can find us at MemphisInvest.com, on Stitcher, SoundCloud, and iTunes. Any questions you can feel free to leave them there for us and we'll get them back and we'll get them on one of the episodes for you. Again I think we're up to close to 30 episodes, over 20,000 people have listened or viewed our podcast, which we thank everybody for all of that. We look forward to seeing you on the next episode. Have a great day, thanks.